Dale's love is his streetstock. Maybe when he gets the modified figured out he will give up the streetstock but for now, he still likes it better. I guess he's still more "comfortable" in it and when you're used to running up front, it's hard to settle for the back or middle of the pack. Dale's had a lot of good luck in the streetstock and it's been good to him in the past. ninth starting spot and claimed the advantage from pacesetter Bryce Olson in lap 16.
trailed by Earl Whitley, Buddy Anderson, and Link Shelton. "We just tracked him down... it was good driving and good handling." said Winchell. persistence paid off in lap 13 as he sailed into the lead lap to the winners circle. The second lap was red flagged for a violent roll over by Tony Bookout in turn one. heat and the "A" feature qualifying him for the pole position in todays main event. Larry McDaniels, and Delbert Smith. wheeled IMCA modifieds, super powered pro stocks and shin'/bashin' cruisers. back," said Winchell. "One day we sold our dune buggies and decided to go racing." taught us a lot about racing." night," he said. "Now my crew consists of my wife Caren and son Todd"
Winchell's fast No.47 racing machine is a Chessmen built car powered by a Chevy engine. 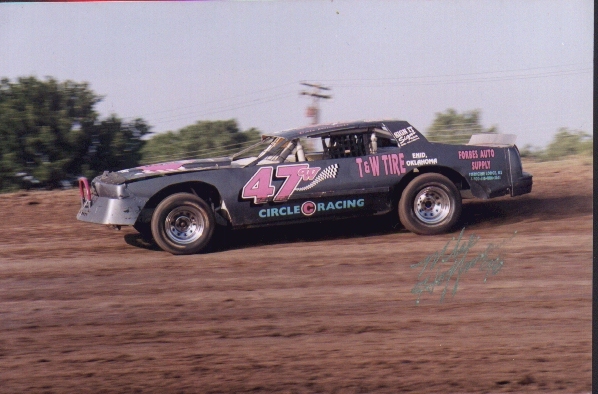 Jerry Derr did a great building the car" stated Winchell. Boyter Tire, and Tharpe Liquor. set my goals higher every year, but when the fun is done, I'll sell it"